Photo: Ali in the van waiting to go home after work today. Oops, his booties have holes in them! How embarassing. Seriously, I ordered a new pair and they are on the way…he goes through them fast! So, I have to travel (for work) to Washington, DC at the end of July for the Taking Action for Animals Conference. 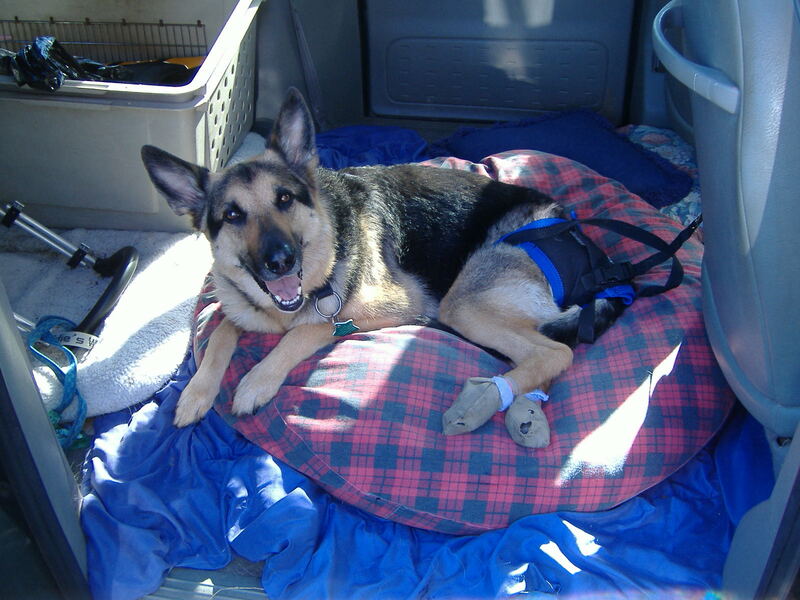 I assumed I would board Ali at the Animal Care Center, where he was hospitalized and had his surgeries, because while he was there the techs had mentioned another German shepherd in a doggie wheelchair who boards there when his people are out of town. I was relieved to learn this was an option, as I obviously can’t board him at a regular kennel facility. Last week I called to ask the rates, knowing full well it would be crazy expensive, but in no way prepared for what they told me: “rehab boarding” (special rate for large, non-ambulatory dogs) is $120 per day. Holy CRAP, I say! How can they possibly charge that much (and keep a straight face)?? Well, my friends, because they have me (and others like me, I suppose…but more so ME because I am poor!) over a barrel. My work trip was going to be 5 days (2 days traveling, 3 days conferencing), which adds up to approximately… shoot, where is my calculator?… okay, got it…$600! For a work trip, mind you, not even some fabulous vacation I actually am choosing to go on. How can I afford that? Have I mentioned that I work for a non-profit?? Oh, and they charge per 24-hour period, not per hour. So if you are a few hours over, they still charge you the whole $120. Nice. But can’t I get the “I spent $16,000 in your facility already, damnit” discount?! Yeah, no…um, that doesn’t exist. So, hating to do it, I asked my boss if I absolutely had to go. In addition to tabling at the conference, ALDF is hosting an attorney/ law student reception for our members on Saturday evening and, as student liaison, she really wants me to be there for that, so she said I could just fly in for the reception, while Maggie is going to attend the whole conference and table in my place. So this reduces my trip to 3 days (2 days travel, 1 Saturday reception). Plus my mom offered, without my even asking, to pay half of his boarding fee, which was really, really sweet. Finally, Maggie really wanted to go to this conference, so I am happy for her that she gets to go now. Still it would be nice if I didn’t have to go at all, but this will cut Ali’s boarding time almost in half, so I have to be grateful for that. And I have to travel for work again in September and October, so this will be a recurring problem that I need to deal with. Could I leave Ali home? Well, I thought so. Maggie offered to watch him without hesitation when she learned how much it would cost to board him. I really appreciated this; she has been so incredibly helpful ever since we moved in together (and even before) and has been simply the best roommate to have while dealing with Ali’s situation. However, Maggie shares with me the not-so-strong problem, with the difference being I am totally used to all the difficult little everyday things involved with taking care of Ali. Lifting his back end up and into his cart is no small feat (especially given his propensity to wiggle about!) and the ramp at our house is actually pretty difficult to negotiate given it is quite steep. There is just a lot involved with caring for my 67 lb. beloved baby shepherd loaf, stuff I have gotten used to. Now, all of this could be learned by another person, right? Sure! That’s what I was thinking, until the day after her generous offer, when Ali completely tipped over in his cart while going down the ramp. This scared the heck out of me. It happened so fast; his cart just caught the edge of the bottom of the ramp when he tried to turn too quickly – even with me holding onto him – and over he went. Then he started flailing and I didn’t know what to do but struggled to stay calm and keep him calm so he would not hurt himself. I could not get him upright in the cart the way he was down so I had to unhitch the cart and get him out of it, which I did, and begged him to “stay!” lying down on the sidewalk while I righted the cart and then got him back in it. He seemed fine, but I was mildly traumatized. I kept having flashes of it happening again. If that happened on my watch — me, who guides him up and down the ramp multiple times a day — how many things could go horribly wrong while someone else was watching him?? This is not to say I don’t trust Maggie – I really do. The best way to describe it is that it felt like an ominous sign (especially given the timing). Not that I am superstitious (well, maybe a little… which reminds me that I heard an interesting piece on superstition the other day in honor of Friday the 13th on NPR and the psychologist was saying that there is not one set of traits superstitious people share but that they do tend to score higher on measures of anxiety – you know, superstitious beliefs as a way to maintain the illusion of control over one’s world. That makes sense to me and despite my penchant for rationality, being of the anxious persuasion I definitely fit the profile. ), but for whatever reason that scary little accident told me I would not be comfortable unless I boarded him. So that’s what we’re going to do. But hot damn, why do they have to be so expensive?! !